Photo taken by Giles Butler during a day of leisure at Cape Adventure International in Scotland. 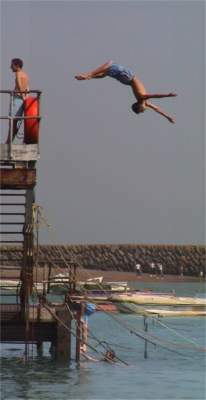 There are plenty of hotshot twelve-year-old BMXers, skiers, surfers and white water kayakers. Given the right equipment and coaching, children learn faster than adults and achieve a higher standard. In Britain there are lots of kayak clubs where volunteers with BCU coaching qualifications run low-cost courses leading to skills qualifications. Kidology is the art and science of making children's courses fun and safe. To get a senior coaching qualification, you have to know how to structure children's courses so that half the group isn't getting into trouble while you're working on a point of technique with the other half, how to spot when kids are getting cold or fed up, and what to do about it. For example, getting a lively game going. Kayarchy's current contributors include several coaches, but they mainly work with adult groups. If you coach children and would like to contribute an illustrated piece on the dos and don'ts, we'll be glad to put it online. See Get In Touch. There's a nice French expression for the things to avoid. Les 4 F (froid, faim, fatigue et frousse) are cold, hunger, fatigue and fear. If a child has difficulty learning to roll or has to be towed for the second half of a trip, it's probably because the kayak is wrong. For a child, kayaking in an adult-size kayak is like trying to tapdance in size 15 shoes. Things are even worse if the kayak is also square with a flat bottom. Please don't send your child out in a short, fat river kayak designed for an adult. See White-Water Playboats. A young child can start off in the front cockpit of a double kayak. Since sea kayaking is about independence, the best way after that is probably in his/her own scaled-down sea kayak like this Greenland 5-year-old. A sea kayak for a child should be lean, mean and fast, but the laws of physics say that it can't be as lean and mean as one for an adult unless it is fitted with stabilisers. Say you want a replica of the favourite sea kayak of a 1.8 m tall man for use by a child 1.27 m tall. You scale down the 5.25 metres long kayak to create a miniature one 3.5 metres long. So far so good, but if you scale down its width from 54 cm to 36 cm it will have only 19% of the stability of the original. (And if you think we've misunderstood Skene's Elements of Yacht Design feel free to write in with your equations!). Also, children have proportionately larger heads than adults so they are more top-heavy. Stabilisers can be in the form of sausage-shaped inflatable sponsons ("sea wings") attached to the side of the kayak alongside the cockpit, or floats on the end of an outrigger arm. This temporary rig for the Greenland child consists of empty plastic bottles attached to both ends of a pole which is strapped to the rear deck. For a slick commercial solution which could be adapted in miniature, consider the Triak illustrated at Other Multihulls For Exposed Waters. In Building the Greenland Kayak ( McGraw-Hill, 2003) Christopher Cunningham describes building SOF kayaks for his two children, who look about 6 and 4 in the photos. One was 2.7 metres long by 38 cm wide, the other 2.08 metres long. He comments that width / stability was not important because neither kayak would ever be used without stabilisers. He gives details of the stabilisers, and of the rockers he fitted so they could enjoy their kayaks in the living room too. Sea Flea, for paddlers who weigh 23-46 kg, so ages 7-10 or thereabouts. 48 cm wide and either 3.35 or 3.65 metres long, and about 9 kg weight. Sea Pup, for paddlers 34-63 kg, so ages 9-14 or so. 4.5 metres long by 48 cm wide and still only 10.5 kg. A kayak designed for a man is likely to be a bit of a burden for a teenager because it will be unnecessarily wide and heavy. Some very nice plastic boats, kits and plans are available for smaller paddlers. See Sea Kayaks To Fit Women. 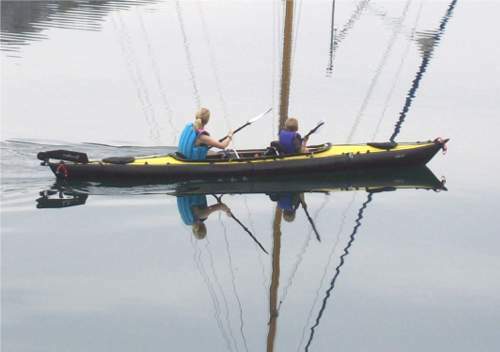 Two teenagers in a touring double kayak can easily keep up with experienced adult sea kayakers. See Two-Person Kayaks. Children often seem immune to cold water and will happily play in the sea until they go blue. In fact the ratio between volume and surface area is much higher for children then adults so in a cool climate they are at particular risk from cold. See Hypothermia. What they need is good kayak clothing. You may not want to buy a good wetsuit if they're going to grow out of it in six months, but how about a thermal stretch suit and anorak? See Thermal Stretch Materials. You can get child-sized buoyancy aids and anoraks from a good kayak shop. See Kayarchy Shopping. As to legal restrictions, see Child Safety and Child Protection Law.